All reasonable care has been taken in the compilation of this website. The statements contained on this site are believed to be correct and accurate at the time of publishing. We cannot be held liable for any loss, damage or inconvenience arising from inaccuracies on our website. We enter into no express or implied conditions, warranties, terms or representations regarding the quality, accuracy or completeness of any information or omission. We are not responsible for the content of any pages maintained by external organisations that can be accessed through our site. 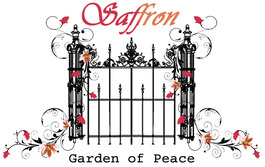 Any external links to products and services, do not necessarily carry the endorsement of Saffron Garden of Peace and any suggestions and recommendations are for information purposes only. If you are aware of any mistakes or information that needs updating on our website, please let us know.